Parnell Damone Marcano, Barbara Mallory, Jayme Lake, and Anthony Gruppuso in The Babies. Photo by Carol Rosegg. BOTTOM LINE: Beautiful singing and a wonderful piano player allow four nervous baby characters to tell stories about friendship, different families, and newly discovered traditions. Different productions have different goals. Some go for a laugh, others for the opportunity to amaze, and others to educate. I'm guessing, or hoping, that The Babies is trying for the latter: this new musical could be called informative, with a few chances for chuckles thrown in. But while this material has some basic lessons, most of us probably learned them in elementary school. 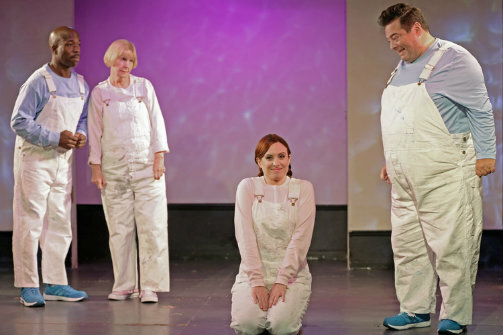 Sophie (Barbara Mallory), Joshua (Anthony Gruppuso), Desmond (Parnell Damone Marcano), and Spring (Jayme Lake) begin the story as unborn fetuses in their mothers' wombs; we first see them during their parents' Lamaze class, helped by projections of a simulated womb. The four sing and talk of the desire to be special, the need for friends, and their differences. As they discover their genders and try to come to grips with who they are/might be, each unborn child recounts tales of what they have overheard from their moms, dads, and siblings. Scene two develops in the maternity ward. Sophie, the “Old Soul” of the group, helps comfort Spring as she realizes that she will have new adoptive parents. Desmond teases Joshua about his imminent circumcision as a Jewish boy. We next see the babies at a “Mommy and Me” class, where Desmond tells about his dad being a soldier and how while his dad is gone, he is the “Man of the House.” The four Taurus children then discuss how they will all learn to walk and talk. Preschool is the last setting for the audience to learn about these kids with songs about potty training and friendship. Written and directed by Lloyd J. Schwartz, who also wrote the lyrics with actor Anthony Gruppuso, The Babies is fortunate to have talented composer Matt Dahan on hand. Dahan, who also plays piano accompaniment, is a welcome component of this piece. His music is beautifully arranged and the harmonies, duets, and solos that Mallory, Gruppuso, Marcano, and Lake croon are impressive—their voices melt together in a pretty and soothing manner. But the topics they sing about—abortion, adoption—are often serious, and the outdated educational feeling quickly gets tiring. And if you are expecting happy, fun babies, unfortunately these characters are in a steady stream of nervousness and fear throughout the show. Since the four actors all play babies, and there are no adult characters, we must use our imagination; we don't actively see what happens to each baby as they experience their new lives, but rather hear about past or future events through narration. Such passive storytelling lacks any kind of action, and while it provides a few moderate laughs, most of the show just isn't that funny. Perhaps the best audience for The Babies is younger kids. While no one under four is allowed, I could see bringing a child in elementary school for the education and humor. But for adults, there isn't much here you haven't seen—or lived through—many times over. The Babies is written and directed by Lloyd J. Schwartz. Music by Matt Dahan. Lyrics by Lloyd J. Schwartz and Anthony Gruppuso. Set Design and Lighting Design is by Josh Iacovilli. Musical Staging is by Gene Castle. Stage Manager is Krista Swan. The cast is Anthony Gruppuso, Barbara Mallory, Jayme Lake, and Parnell Damone Marcano.